As a dietary supplement, use 3 drops 3 times a day under the tongue. 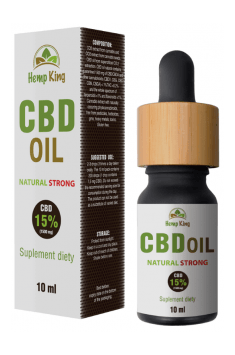 The supplement is characterised by a rather high concentration of CBD. Each drop of the oil contains 7.5 mg of pure CBD. CBD dosage is to a great extent an individual matter. Scientists do not believe it can be overdosed, and no side effects occur even in the case of long-term supplementation. The organism also does not develop tolerance to its activity or addiction to the active substance. It is believed that supplementation should begin with small doses – even 3 drops administered sublingually 3 times a day should bring significant therapeutic benefits. If there is no improvement after a few days, the dosage can be increased, for example to 5 drops taken sublingually 3 times a day.